I do not recall the Ford logo as having that loop on the "F". As a graphic artist or from a marketing perspective, would you have the F like that? It looks like a little "e". So, you can criticize the logo and call it a FEORD. I would not want to open myself to that if I was creating the logo. Does that make sense to anyone? 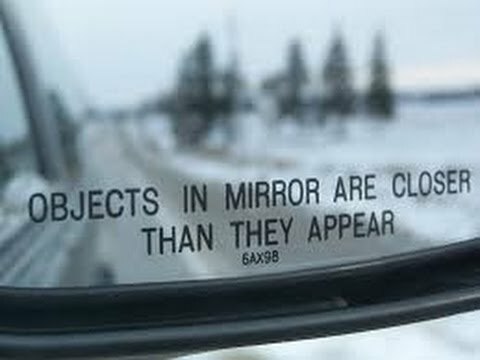 Last edited by Patient; 13th April 2019 at 05:53.
what about the outside rear-mirrors in cars, i can remember the text "objects may appear closer than they are". there is something in common with many other mandela effects, u can research old articles in google and u can even find david letterman jokes about it, another proof of merging timelines?
" Loka samasta sukhino bhavantu / May all beings in all worlds be happy and free and may the thoughts, words and actions of my own life contribute in some way to that happiness and to that freedom for all "
The thing about this one is the scene no longer makes sense without the braces. I know the actress has said herself that she had no braces, but literally the scene doesnt make sense without it. He was an outcast badguy with a metal grill. He goes the whole movie without talking(I am pretty sure) and always has a frown on his face. He even used his steel teeth to kill people. Crashes at the end( coming from the moon if I recall correctly, meaning this was moonraker) and then this sweet young lady comes up to him and smiles. He sees her braces and then he smiles back. It is how they make a connection. The scene doesnt really make sense if they dont have a connection because this is the first time you see this girl. And this is what makes the music in the movie synonymous with an epiphany moment! Without the braces, what is the connection? When you say it was flipped back do you mean one thing or the entire Mandela Effect? I find it synchronistic and fascinating that just last night before going to bed, this was the topic of conversation with my girlfriend. Particularly, I was telling her that I couldn't help but to feel that some of the "experiences" I've had over the past few years when sleeping are merely me experiencing life in a parallel reality. As I explained to her, they don't feel like regular dreams. Often times, there is no rhyme or reason or climax or point to some of these "experiences". What I mean by that is that often, these "experiences" will be of me just doing everyday, mundane stuff, e.g. brushing my teeth, reading, carrying on with casual conversations, going to the bathroom, etc. The one difference being that I notice that everything in this other reality is just slightly off or different than in our current reality. I was explaining this to my girlfriend that just a few days ago I'd come across a recent Bashar video where he said a few things regarding parallel realities, and found it to coincide with what I'd long felt was the case (in the case of my own experiences). I brought up 9/11 in our conversation - I used the pentagon attack as an example where there are many very credible, well put together people who will swear that despite the physics of it, they saw an airliner make the low pass and slam into the side of the pentagon. Yet, on the other side of the spectrum you also have many credible, well put together people who will also swear that what they saw hit the pentagon was most certainly NOT an airliner (I for one, don't believe it was an airliner either). I know it seems I sort of strayed from the premise of this Mandela Effect Reversal thread, but my intuition is telling me that this is all interconnected. Without sounding like I'm giving a free pass to societal ignorance and decay, what if SOME of the events or moments (9/11, Berenstein vs. Berenstain, fruit loops vs. froot loops, etc.) that we experience in our lives are regularly coalescing with an alternate version of this reality, thus, no matter how much debating and discussion is had, why some of the most credible, well put together people will never ever sway from the fact that they saw an airliner slam into the pentagon...because they actually did. Suffice to say, I seem to notice these sorts of anomalies picking up over the past few years, which again, brings to mind what Bashar mentioned (see below starting at 1:45). The gears in my mind are most certainly turning. Last edited by ChristianSky; 13th April 2019 at 15:11. I love this thread; where else could you discuss such things without appearing certifiable? ChristianSky, very intriguing post, thank you! I think you would be very interested if you were to take a look at the "EXPERIENCERS:.." thread started by Rachel. On that thread, we've been discussing exactly this idea of parallel realities, particularly as we encounter them during the so called "dream state." This is something a number of us have experienced and likely many more who have not posted about it have also experienced the phenomenon. Your description is exactly as described by Rachel and others. The geography, topography is consistent time and time again when we return to these other realities. I am going to link to Rachel's thread here. There are a number of fascinating posts leading up to this particular one that I provide a link to below, and more following this post. I think you might find this resonates with what you've been experiencing. Another very compelling piece of this giant puzzle that we are all a part of! Last edited by Forest Denizen; 13th April 2019 at 22:05. I will post any new changes I experience on this thread. I think this is a case of moving between parallel worlds. I used to do have this experience regularly up until my 20s, in very obvious undeniable ways. Back then you learned very quickly to keep stuff like this to yourself. My friends would often tell me that whenever they were around me they would have strange mystical type experiences, and that it only happened when I was around. Given my background of experiences, the Mandela Effect shouldn't have surprised me as much as it did, but I think it did because it was happening on a mass scale with a very select few events in question. It felt suspicious I guess. Like maybe someone/something was behind it. Berenstain and Berenstein has probably switched around hundreds of times in my reality. I just hadn't noticed. Same with Fruit Loops and Froot Loops. I am a student or Buddhism and a practitioner. The Buddha taught that nothing exists inherently from it's own side. All phenonema are imputed by mind. When you change your mind, the world around your changes. This is happening all the time. Last edited by Kejaranhybrid; 15th April 2019 at 10:46. ChristianSky, thanks for your input. This resonates with me. I too have had many parallel world experiences, in my waking life and in my dream state. The two have a very different quality about them tho, but I wont get into that here. This is something a number of us have experienced and likely many more who have not posted about it have also experienced the phenomenon. Your description is exactly as described by Rachel and others. The geography, topography is consistent time and time again when we return to these other realities. I am going to quote Rachel here from that thread. There are a number of fascinating posts leading up to this particular one, and more following this post. Hi Forest Denizen, Thanks for this post. I too have had these experiences. Would also love to check out this thread. Thanks! I have always found the whole subject of parallel realities somewhat uncomfortable.. disturbing. When I have found myself dreaming in what seemed to be a parallel reality, it has never been a good dream or a happy dream. Instead, it has always felt somehow off, with an uneasy undertone to the experience. I only ever feel excitement about the topic because I love it so much but I’ve had these dreams for roughly five years now and none of them could be described as fun either. The primary reason for me is the very nature of the experience. So far I’ve found that just as I start getting used to something it intensifies and shifts in some way, so I’m always kept on my toes. I don’t mind, it keeps things progressing, but it’s intense when it comes to these dreams. I’m this me in the other self and I have to try and recall the life of the other self. It’s like trying to recall a dream that you know you had, you can feel it, but can’t remember any of the details. I suspect the purpose is integration of selves, long story that I won’t go into but that’s touched on in The OA too. At first I was almost panicked. I’d find myself standing in a street somewhere, not knowing where I live, with no way of contacting anyone I knew. Discovering/realising that is a scary process in itself. Meanwhile I wasn’t aware I was dreaming, so for me I just suddenly lost all my memories but could remember my son and BF, which is like losing myself, my loved ones, and becoming displaced and homeless. I felt lost. Then awareness would start creeping in, which introduced a new wave of emotions to deal with. Long story short, those earlier dreams pretty much consisted of that and trying to figure out where I lived, I’d be able to sense the general area in which I lived and once I came up with an approach or solution I’d wake up. After some experience I’d have more awareness, so the situation for me became trying to remember the details of the life of the other self (it always was that but I hadn’t previously realised it). But still the awareness that I’m dreaming is limited and varies, so I confuse this life with that one. That state is different to this one, so awareness manifests differently. On reflection I can see the awareness in my knowledge and behaviour but I’m in the moment, I don’t reflect, hence I don’t process and comprehend so well at the time. And always I’m still feeling lost, but I did manage to find a previous residence without going from door to door (my previous idea for a solution) and now the dreams have changed again. The most recent one was three nights ago. A lot to go into in full but I ended up at the home of some old friends. We were just catching up like friends do when they haven’t seen each other in a long time. They fully recognised me but I didn’t recognise any of them, but I could feel who they were. I still kept confusing this self with that one and when I reflected on it they seemed to be aware of that but didn’t correct me. So it’s getting complicated, I don’t know what that is yet, maybe a different dimension. Something different happened when I woke up this time too, well almost happened, I stopped it. I woke up with the clear sense that something was about to happen while I was awake, like I was going to be taken somewhere. I don’t know why I wasn’t up for it, natural human fear of the unknown I suppose, but I felt that I didn’t have time to fully rouse my body before it happened, so I tried to quickly call out to my BF. Too late, my eyes went and my body was already paralysed by the time I tried to yell out. Hard to explain what happened to my eyes, they closed and it felt like my eyeballs rolled back or fully dilated. Overall it would be best described as being somewhat unplugged. But I was conscious so I fought it, regained control of my body and quickly yelled out to my BF. I sensed nothing negative about it, HS never intervened, so next time I’ll go with it and find out what that’s about. I have shared an experience of going into my future self on another thread, will find it and post it here. Thank you, Forest Denizen - I appreciate your feedback. Back in 2013 when these "experiences" started (or at least when I started becoming aware of them), under the advisement of several wise individuals, I created a short-form journal to start documenting them - now almost 100 pages long. Other than just a small number of people, I've been reluctant to share my experiences - even within the Project Avalon forum, mainly for the reason that I'm a very private/reserved individual. However, another reason for not sharing my experiences is simply the fact that I have many unanswered questions regarding my experiences, and because of my own hard headedness, I often think to myself that I'll just figure this out on my own. Thus, believe it or not, why I haven't even looked at the "Experiencers" section to this point. Yet, I am well aware that there are many that fall into the category such as the one I find myself in, within the Project Avalon community. I will definitely take your recommendation under advisement. Thank you, again. Hello lovely Mr F Denizen. Just a reminder that the Experiencers thread is a private, members only thread. OK to post links to it on public threads but not the contents. Don’t stress at all about this time though, it’s all good. In my excitement to share the info contained in your wonderful posts, I forgot that it was in the “members’ eyes only” area. I thought Kirk Douglas had died years ago, nope, still alive. Hello, Avalon...long time no see. The Mandela Effect is one of my top interests of the esoteric variety. I notice things, but cannot name anything specific (other than, "I thought he/she was dead"). I am a lifelong observer and feel very connected to the circulation of human experiences, from a soul perspective. There is no doubt in my mind that over the past several years things have been winding up for us humans, and that reality is being blurred. Also, my dreams are off the charts...very vivid, very real. Then again, reality is only a state of mind. Yes, it is true that many things that people brought up were indeed due to faulty memories - and in most cases those people were asking for the opinion of others for verification whether it was a faulty memory or not. The good thing about that is that people were asking. We need people to ask questions and not just accept things right? When I first came upon the Mandela Effect I thought right away that this could be something that was created online to test the population. I knew that I needed something solid. I wasn't going to just accept what I read on the internet. So I went digging in our home because I knew that we had a couple of the Berenstein Bear books but I wasn't sure if we still had them. When I found that book that I had read almost a hundred times to my kids and I saw that that book had changed, well yeah, I freaked! I ran and showed my wife and kids and they all were astonished that it had changed. Mandela effects cannot and should not be brushed aside as simple false memory. The name of the South African terrorist is unfortunate, but this phenomenon is deep rooted. Whether it involves timeline shift or parallel reality, I don't know. But we have to be wary of AI psy-op. It may do a lot of flip-flopping. The Gettysburg speech: Was it "fathers" or "forefathers"? but AI, in cahoots with Google, is pretending to be the former. I really don't care much about minor changes in the lyrics of popular songs and such, because popular culture is what it is. It comes and goes and is of no historical significance. But the mask of Pharaoh Tut is. He definitely had one single cobra on it. Never a vulture. When did you discover the change to Tut? I did not hear about this one until just now, and like you I recall it with only the cobra.